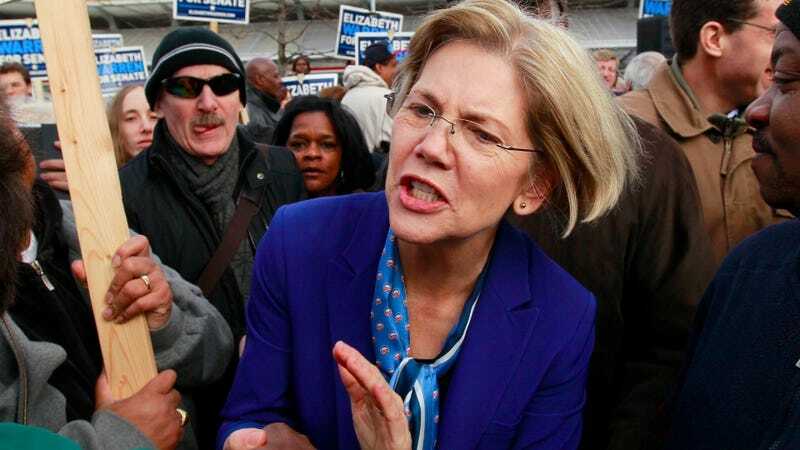 Massachusetts Senator Elizabeth Warren asked bank regulators at her first Banking, Housing and Urban Affairs Committee hearing today a pretty obvious question: When was the last time you took a Wall Street bank to trial? Their sheepish answers imply that the group is not used having the notoriously feisty former leader of the Consumer Financial Protection Bureau hanging around. "We do not have to bring people to trial," Thomas Curry, head of the Office of the Comptroller of the Currency told Warren. Next, she asked Elisse Walter, chair of the Securities and Exchange Commission, who said that the agency has to consider how much a bank will give up without going to court against trial costs. "I appreciate that. That's what everybody does," said Warren (a former Harvard law professor). "Can you identify the last time when you took the Wall Street banks to trial?" "I will have to get back to you with specific information," Walter said. "There are district attorneys and United States attorneys out there every day squeezing ordinary citizens on sometimes very thin grounds and taking them to trial in order to make an example, as they put it. I'm really concerned that 'too big to fail' has become 'too big for trial,'" Warren said. You tell 'em. Watch Warren in action over at The Huffington Post.